Ken & Rebecca u have a gorgeous home. Moose Pines was a wonderful experience,clean, lovely, with all the comforts of home. We couldn’t have asked for a more enjoyable space to relax in with whatever you need within a 5 minute drive. Rooms were spacious and comfortable, with a closed in back deck for our furry friend. Thank you Ken and Rebecca for opening your property to us, we definitely plan on staying at Moose Pines again! It was a really dream getaway! We arrived late Friday night drained after a work day and driving in traffic, but the place we found ourselves at the end of the day was definitely worth that. 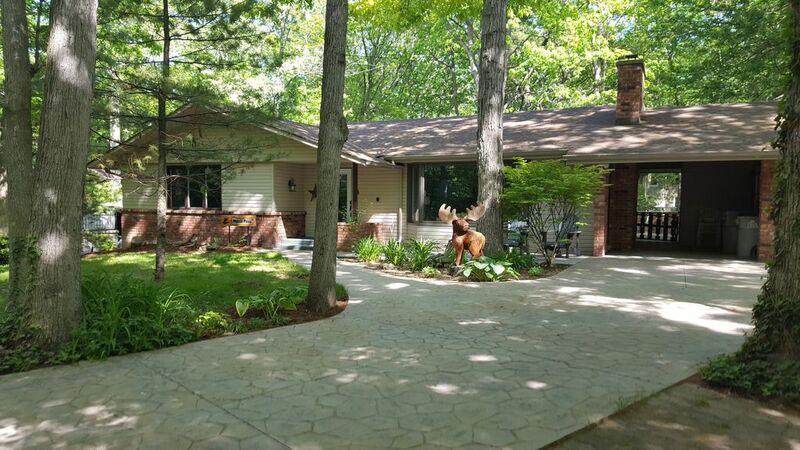 Moose Pines Cottage is a lightful, spacious, clean contemporary and very comfortable, perfectly maintained cottage. The community is quiet and friendly. The place looks great on the pictures but reality is even better. First time in my life I would like to come back to the same place! Thanks a lot Ken and Rebecca! Wonderful space for the girls! My daughters and mother and I stayed at Moose Pines for a Girls Weekend. The cottage is very spacious, the beds are wonderfully comfortable, and we had everything we needed to relax, cook, play games, walk, and take a quick trip to Bayfield for some Christmas shopping. We can't wait to return for some summer fun with the guys too! Moose Pines cottage has a good location and is nicely renovated, however we found many disappointments with the house and grounds. First, upon arrival the grounds were messy, the two Miskoka chairs were dirty, covererd with dropping from birds and other critters.The windows dirty and covered with cobwebs The deck was worse. Grill was dirty, the dirty cover was thrown onto the railing and the utensils left outside without being cleaned. The chairs were strewn around the deck and tables dirty. (We chose not to use the deck throughout our 13 day stay.) Once we got inside we could not find the WiFi code and had to call the owner. Inside, the master bed was in such a state of disrepair, the frame sounded like it was about to collapse. The noise was such that it kept us and our guests awake when we climbed into and out of the bed throughout the night. The floorboards were also equally squeaky. Every door in the house squeaked until we got some WD-40 and oiled all the doors. The bedroom has an ensuite, however it does not include a shower/tub so we had to either share the other bathroom on that floor with guests, or go downstairs to the basement. There was an offensive smell in the basement. After exploring, I discovered there was a wastebasket of dirty diapers in the laundry room. We have rented another home for next summer. Marilynne, it's unfortunate that you have left such a negative review of the property. The ad clearly represents that there is no shower in the ensuite. Per your signed rental agreement, you indicated that there were 2 guests staying at the cottage, yourself and one other. Your review indicates that you had over night guests which is a violation of the agreement you signed. The Wi-Fi password along with all other information regarding the cottage was provided to you via email 2 weeks prior to your check in date. The property is maintained and as a result of being in the woods, cobwebs and animals are unavoidable. It would have been appreciated for you to contact us with your concerns prior to leaving a review. Great cottage, would highly recommend. Location is fabulous!! Cottage is clean and furnished with lots of seating , kitchen has everything you need. Great family cottage for a week away. Was very thankful it is air conditioned during the extreme heat. We certainly enjoyed our stay. Would highly recommend this property. Nice quiet area, and beautiful trees everywhere!! Profitez de théâtre en direct au Huron Country Playhouse et Grand Bends carnaval d'hiver. Le marché aux puces Pinery est ouvert tous les dimanches à partir du long week-end de mai à l'Action de grâces.